do not have to travel during the holidays in Java, Kalimantan many attractive tourist sites that can be used as the destination when you want to travel. For the umpteenth time, just a reminder that Indonesia has a beautiful nature and hard to beat by any other travel outside Indonesia. And here are 5 Location Travel Interest Kalimantan to your destination. 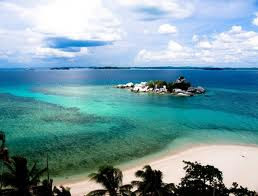 This is the second diving paradise in Indonesia, after the Raja Ampat which became a byword many people in 2011, which is in East Kalimantan Derawan Islands. The archipelago is famous for its underwater natural beauty. So, do not forget to dive, because you will be presented with various coral reefs and fish - beautiful. Derawan archipelago consists of several small islands. The island's most frequented by tourists is Kakaban. The divers from home and abroad race - the race to meet the hawksbill turtle (Eretmochelys imbricata) and green turtle (Chelonia mydas), which was fun to swim in the sea. In addition, a place not to be missed when visiting this place is Lake Kakaban which is the lagoon. The lake is formed from seawater trapped in the island for hundreds of years and mixes with rain water. If you come to this lake, you can see the jellyfish - jellyfish swimming upside down, tentacles above. Lake as there are only two in the world, his colleagues in Uganda, namely Lake Victoria. When speaking Martapura, can not be separated from the gemstone. Yes, this place has become the main location of the tourists who have a hobby of hunting gemstones and diamonds. Well, for you lovers of precious stones and various processed products, can come directly to the stone trading center for diamonds. 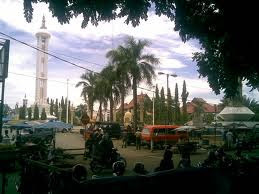 Martapura, there are two centers of trade resulting from the processing of precious stones, the Stone Market and Good Earth Market Light. While visiting the Stone Market and Good Earth Market Light, you can find there many stores - stores that sell a variety of handicrafts gemstones. Ranging from bracelets, rings, necklaces and earrings you can find in this market. Visitors are free to choose which shop to enter. More fun again, if you are good at bargaining, the price obtained can be quite cheap. Not only gemstone, this market also sells sasirangan, typical fabric Kalsel. Road - the road to Borneo incomplete if they do not come to the market floating in the River Kuin. 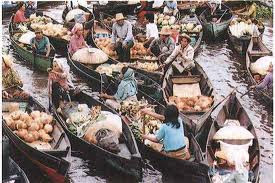 Market that characterizes South Kalimantan you can find not far from the center of the city of Banjarmasin. Arriving on the banks of the river, boats will pick you to surround the river. There are two packages offered, namely the package around the river and around the package at the same visit Flower Island. The best time to visit the floating market is dawn. At dawn, the market is still filled with boats that peddle goods. Ranging from groceries to the kitchen equipment, the school even exist in this market. Do not forget to taste the typical breakfast Banjarmasin, soto Banjar. Feel the thrill of exciting enjoying soup on a boat that rocked. Still River Kuin, there Kambang Island is a habitat of monkeys. If lucky, travelers can see the proboscis monkey, the monkey idung long. This tourist area is not less exciting in West Kalimantan, Park Bougenville. 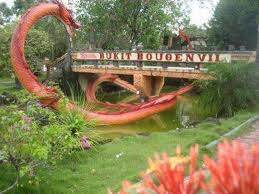 Bougenville garden is a garden which is dominated by Bougenville interest. No responsibility - responsibility, various Bougenville planted comes from within and outside the country. There are about 46 species counted Bougenville flowers in this garden. Although dominated Bougenville, visitors who come can still see that there are a variety of other flowers like, aglonema, antorium and various types of orchids. In addition to various beautiful flowers, garden Bougenville also provide other fun facilities, such as a mini swimming pool, area was super cool and greenhouse. One of the favorite places is the homogeneous forest. This region is filled by a grove of trees aloes. If you sit in this area, you will be presented with a super cool air and pollution free. 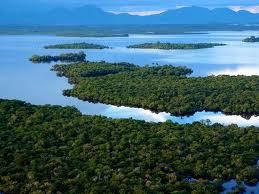 Therefore, homogenous forest is also often referred to as super cool area. Sentarum lake is a seasonal lake and become a part of the National Park Lake Sentarum. When the rainy season arrives, Lake Sentarum be flooded depths of 6 to 14 meters. Water is also included on the Kapuas river overflow and flow of the surrounding hills. But the contrasting scenery will appear when the dry season arrives. At that time 80% Sentarum Lake area will dry out. At this time, the community around easily harvest fish - lake dwellers. There is a rare sight that can you see during a visit to this lake, the forest harvesting honey bees. Sentarum Lake National Park is a paradise for birdwatcher. Here, you can see the hornbill or the iconic Dayak community. If lucky, you can also see bekakak flying low past the speed boat. Tiny winged bird blue and golden yellow body with a beautiful fly.